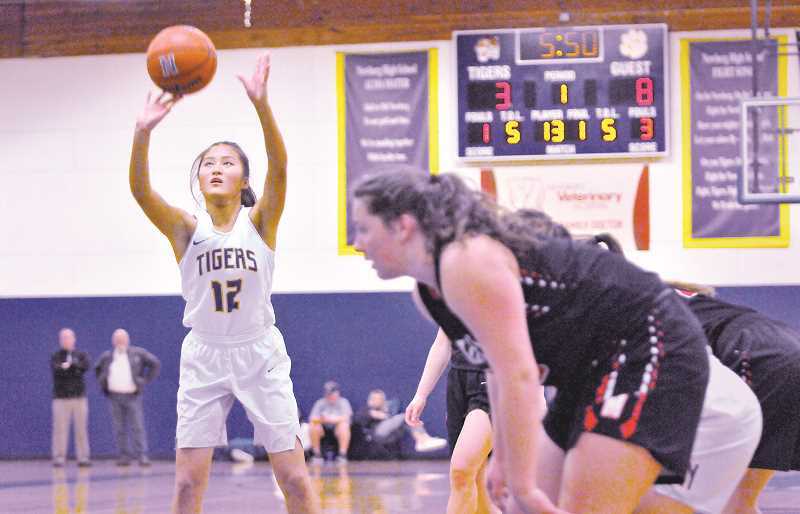 In its first home game since Jan. 8, Newberg girls basketball faced a similar opponent in rival McMinnville. The Grizzlies, like the Tigers, are looking for consistency in conference play and have a relatively inexperienced roster. In the end, it was McMinnville's playmakers that made the difference in the game, as the Grizzlies (9-8, 3-2 Pacific Conference) won 52-46. The Tigers (9-8, 1-4) are on a three-game losing skid and learning the hard lessons of a transition season. "I thought we played really hard and it was a good high school basketball game," Newberg coach Luke Lindell said. "We just aren't doing some of the things you need to do to close games, and some of that is just youth and inexperience." Newberg got out to a slow start in the first quarter, falling behind 8-2 and struggling to defend in transition. Once they settled in, though, the Tigers trailed by just one – 14-13 – heading into the second frame. The game remained close throughout as McMinnville never amassed a double digit lead. The Grizzlies thrived in transition, but in the half court they were most successful when setting up a 1-on-1 for senior guard Emily Boggs or sophomore forward Kylee Arzner. Arzner – whose older brother Luke stars for the boys team – was a problem for the Tiger defense all night. Her knockdown midrange jumper and impressive ball handling ability were on display throughout much of the second half. "They hit shots and you kind of hope that they aren't going to hit those looks," Lindell said. "I thought we weathered that and at times this year we haven't necessarily been able to match that scoring. We did tonight – it just wasn't enough in the end." At the half, Newberg trailed 30-26. 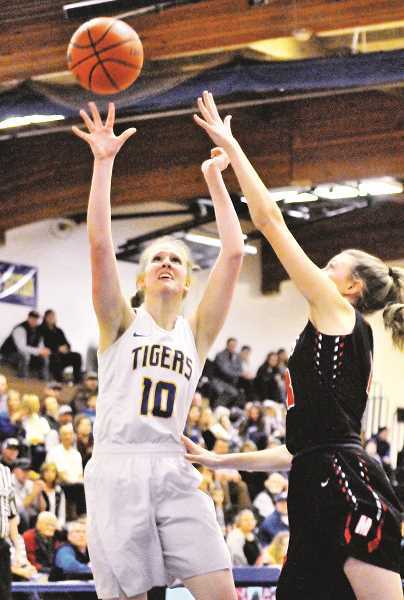 A physical, low-scoring third quarter tilted in favor of the Tigers as they outscored the Grizzlies 9-7, cutting the McMinnville lead to 37-35 entering the final eight minutes. But as the quarter waned on, the game slowly slipped away from Newberg. McMinnville led 47-42 with just under 90 seconds remaining, content to hold the ball and milk the clock until a Tiger player committed a foul. It got as close as three in the final minute, but a late flagrant foul committed by Karly Fouche sealed the game in favor of the Grizzlies. Late game execution was a point of emphasis in the locker room after the loss, according to Lindell, who is maintaining a positive attitude with this group as it endures the tribulations of a season in which its roster is young. Still, though, the No. 39-ranked Tigers are exceeding preseason expectations and hovering below or near the playoff bubble. "We're doing well – there's just a lot of youth and inexperience," Lindell reiterated. "With the exception of Sherwood, we've been within two points with two minutes to play in every game we've been in. These kids understand that they could be 4-1 in league if we just execute down the stretch, so that gives us a lot of optimism and hope going forward as we learn from those experiences." Limiting turnovers and consistently defending in the half court and transition are areas in which Lindell thinks his team can improve. With more time on the court comes improvement in those areas, he said. For many of these girls, this is their first year on varsity, and they have already been thrust into key roles. How they respond to adversity during the final seven games will determine if this inexperienced group gets a taste of the postseason as well – an experience that would be invaluable as many of the freshmen, sophomores and juniors head into the offseason. "There is no substitute for experience and they're kind of getting thrown into that fire," Lindell said. "The expectations here are high for performance, we don't make excuses and we have to execute. We're not there yet, but we're on our way." Newberg's next game pits the Tigers against a Liberty team on a four-game win streak. The Falcons (10-7, 4-1) host the Tigers on Wednesday night at 7:15 p.m. After that game, Newberg plays at home on Friday against Sherwood (10-7, 3-2), who the Tigers beat 39-23 on the road Jan. 18.